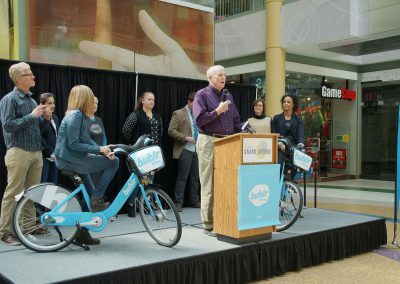 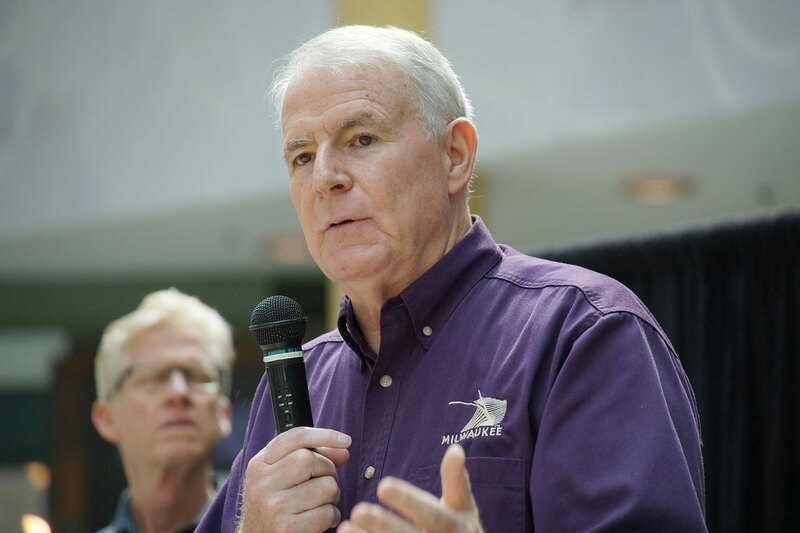 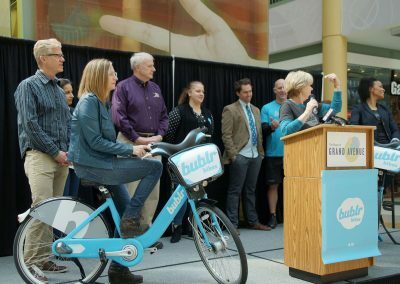 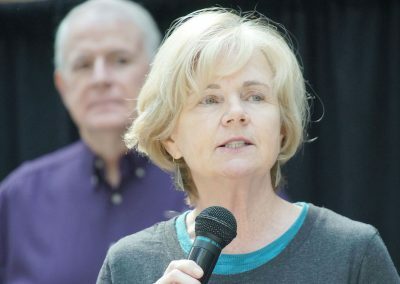 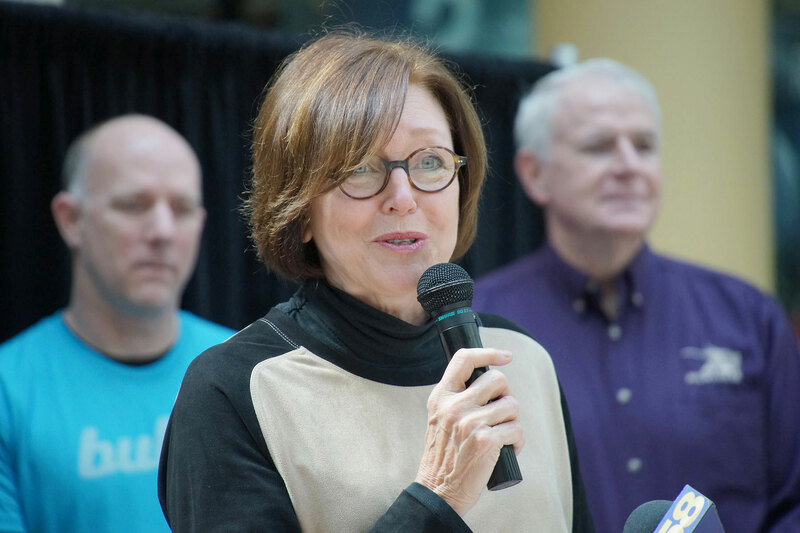 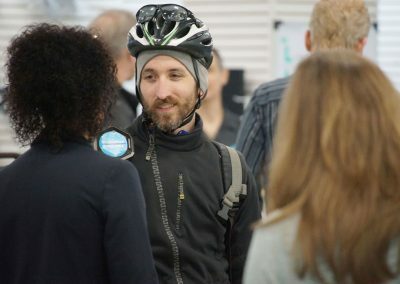 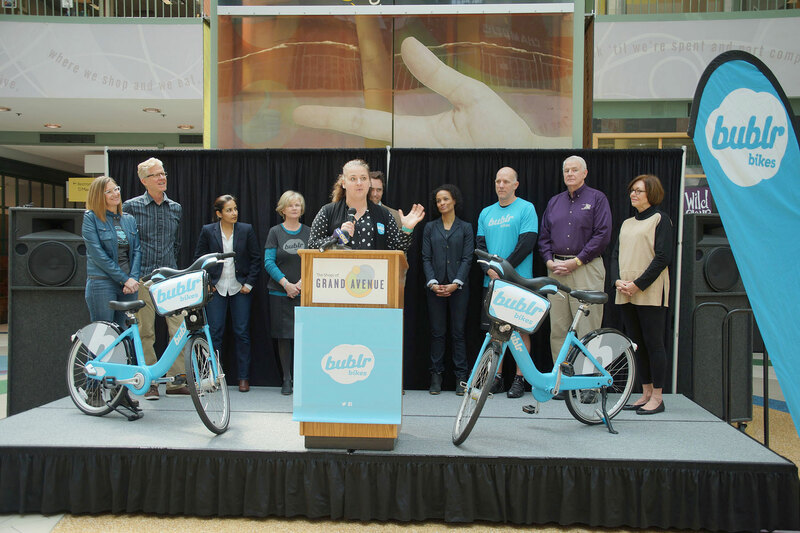 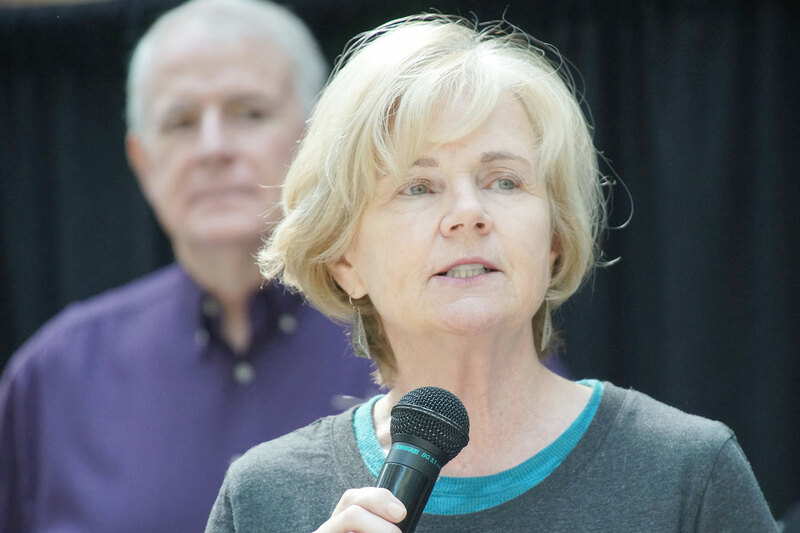 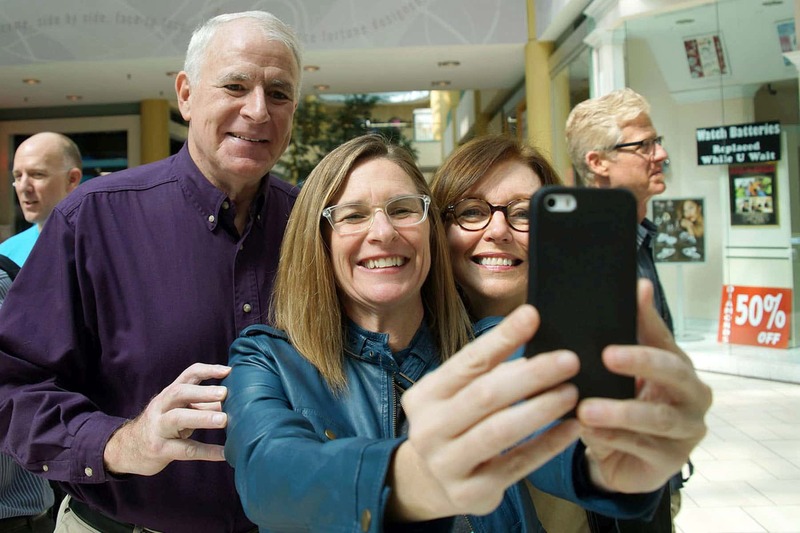 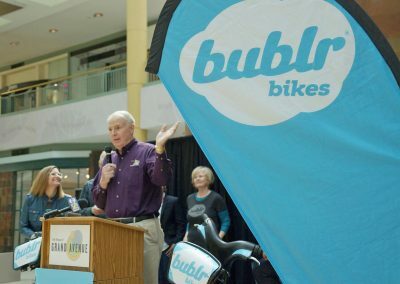 To commemorate its open house celebration and April 14, also known as Milwaukee Day because the numerical date is the same as the city’s 414 area code, Bublr Bikes offered free rides to the public. 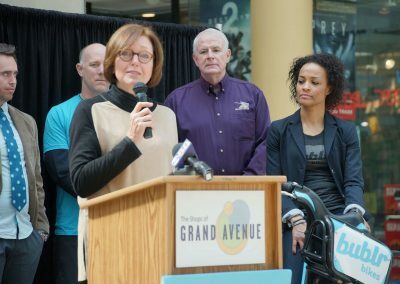 The Shops of Grand Avenue, in the heart of Downtown Milwaukee, was originally created as an urban shopping plaza in the 1980s. 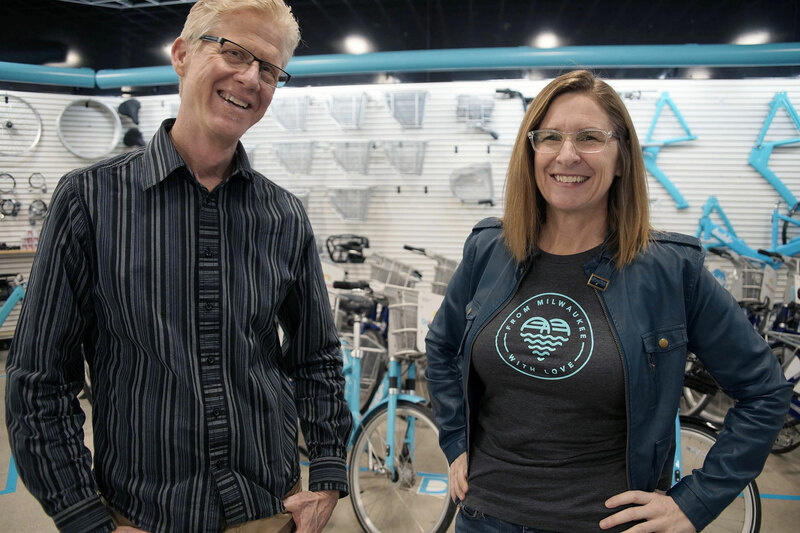 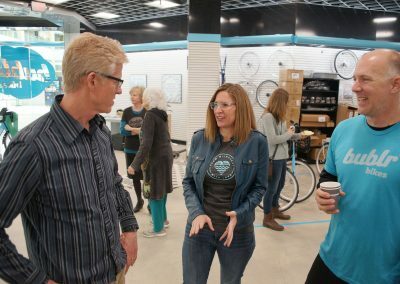 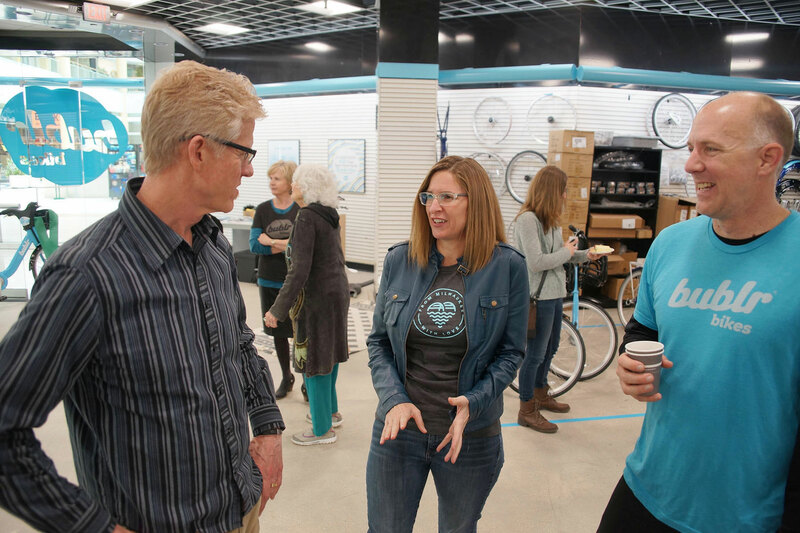 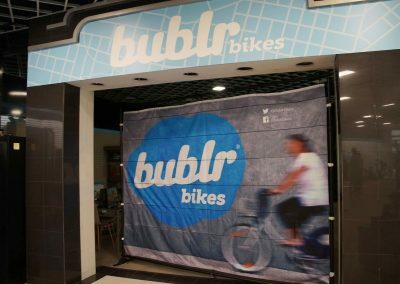 Bublr is leasing 6,275 square feet, where it has located its offices and a facility to maintain its fleets of bikes. 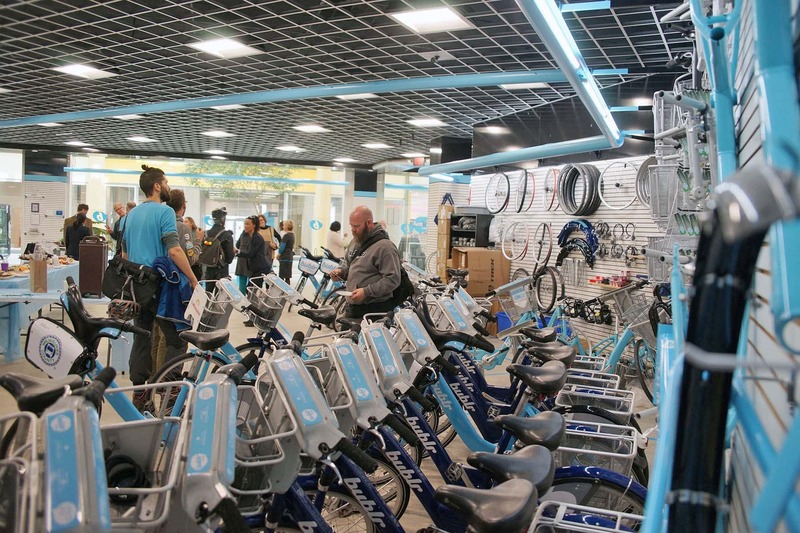 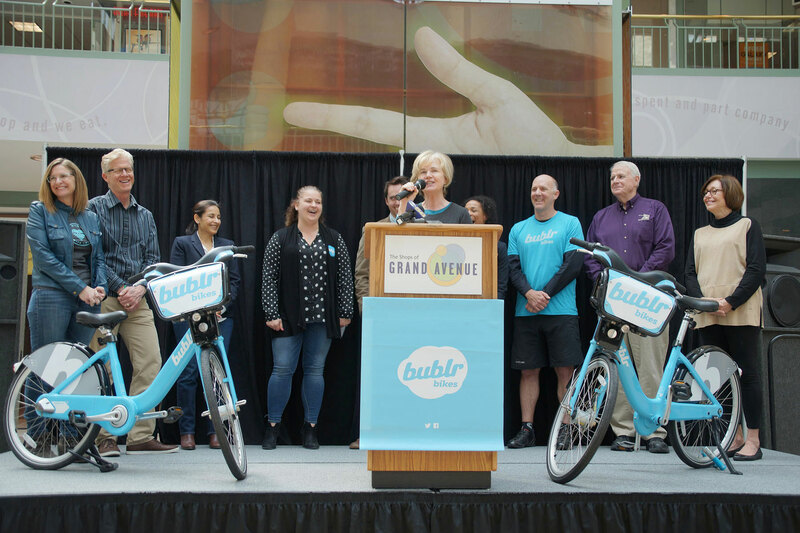 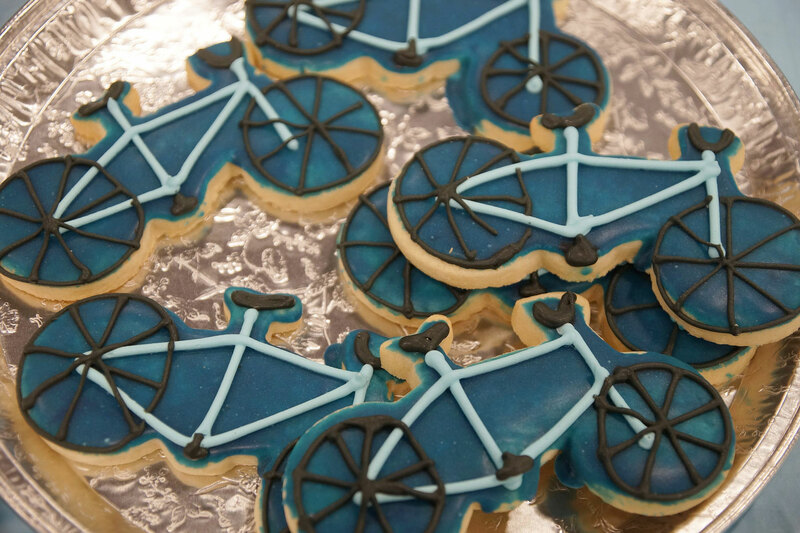 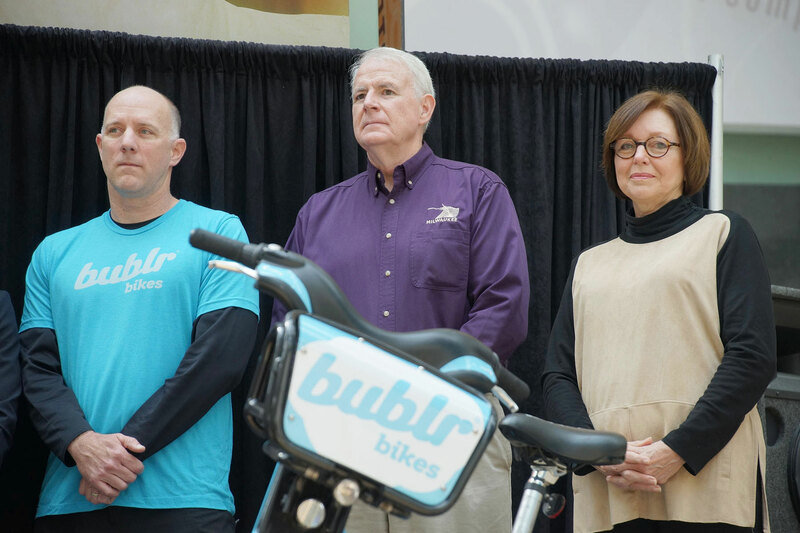 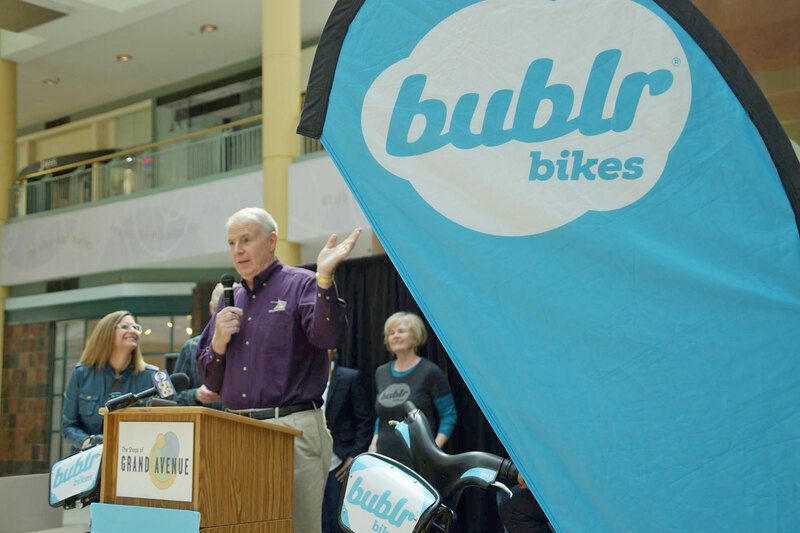 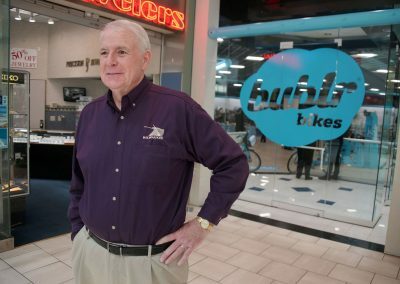 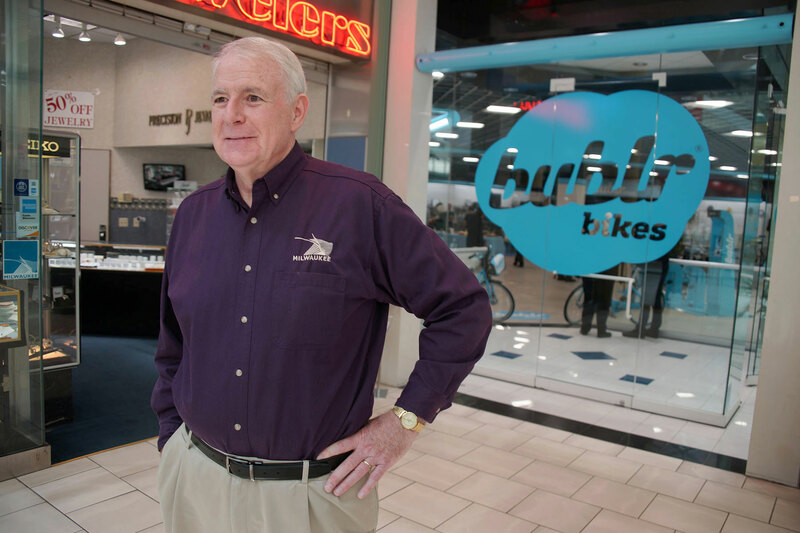 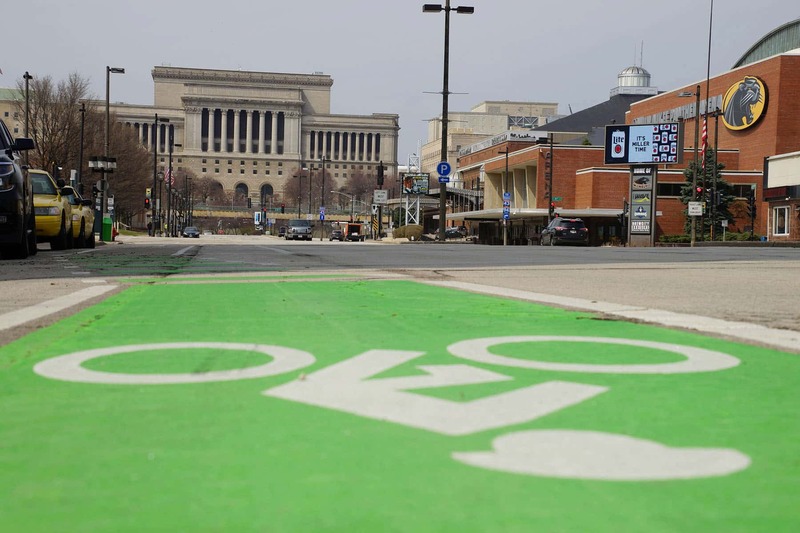 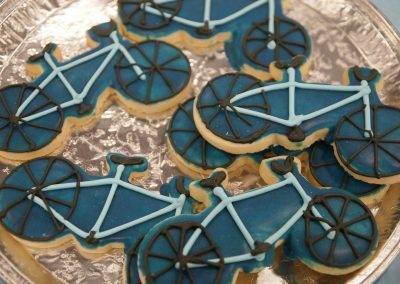 “Bublr is our ideal first tenant as we begin to reinvent the Grand Avenue. 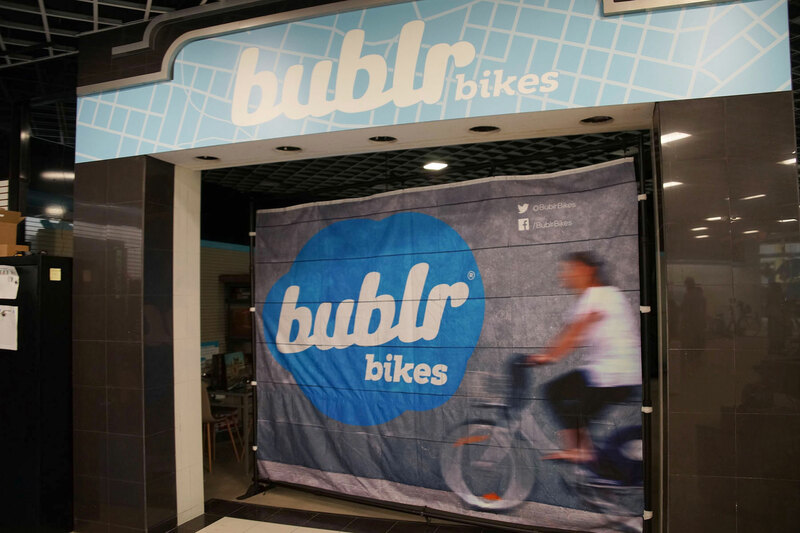 The energy and dynamism that Bublr brings to the Grand Avenue will help us launch our turnaround of the shops. 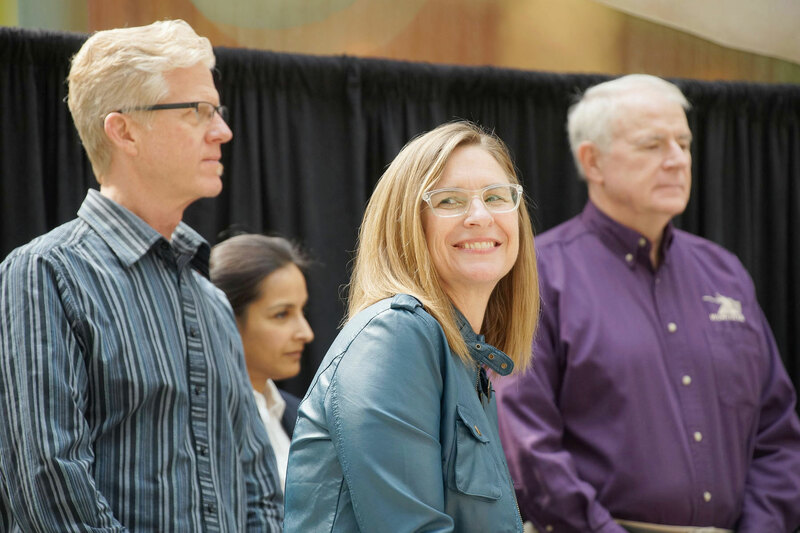 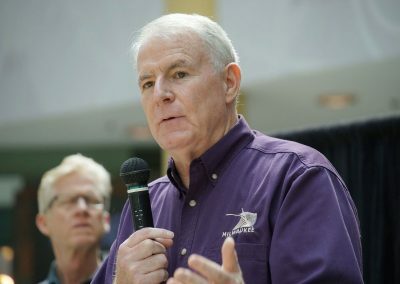 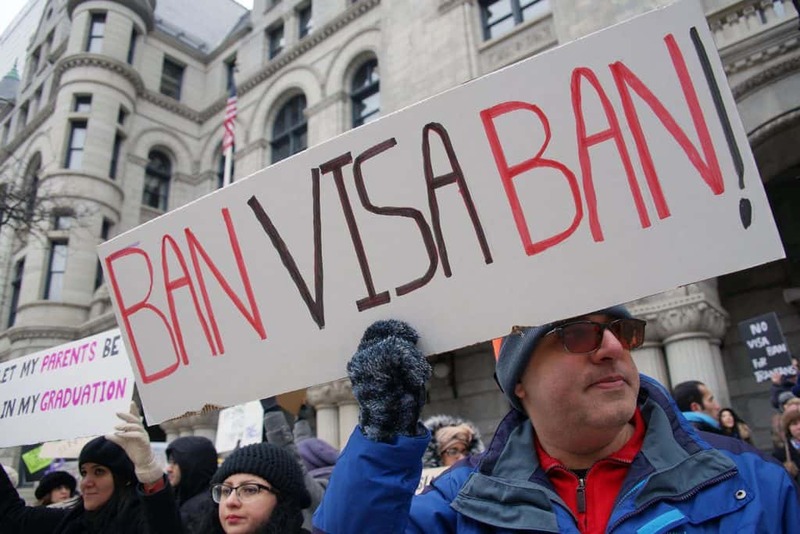 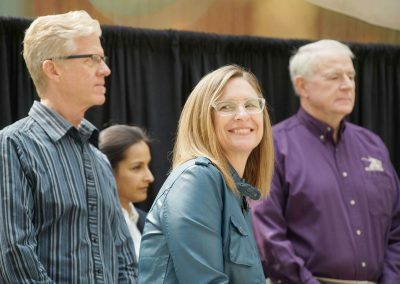 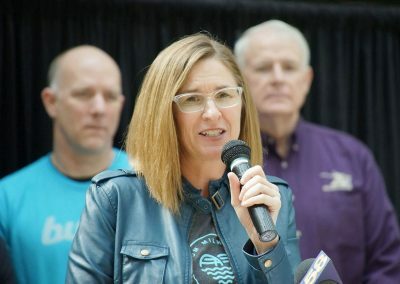 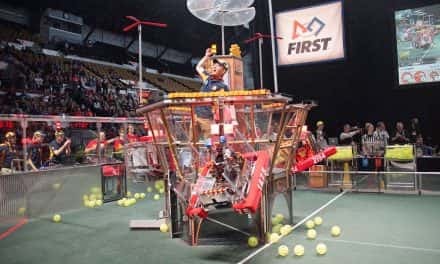 We look forward to more exciting new announcements like this in the coming months,” said Tony Janowiec, a principal of the Grand Avenue’s ownership team. 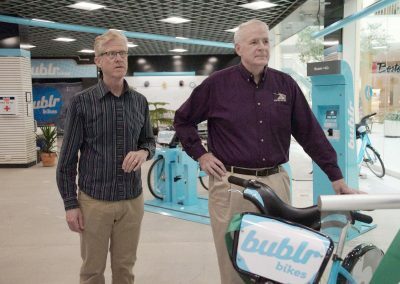 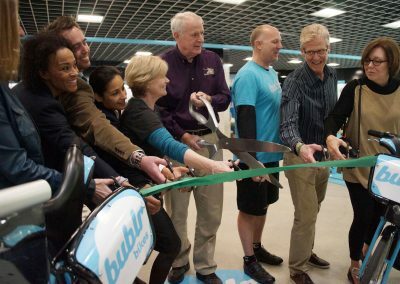 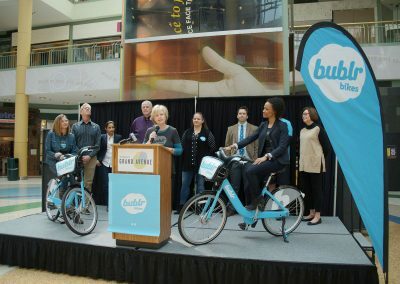 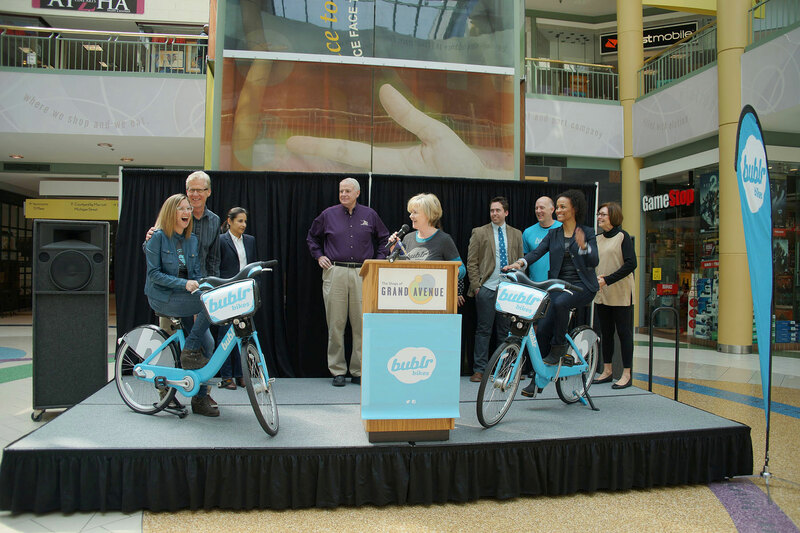 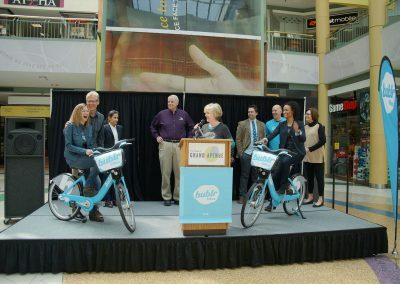 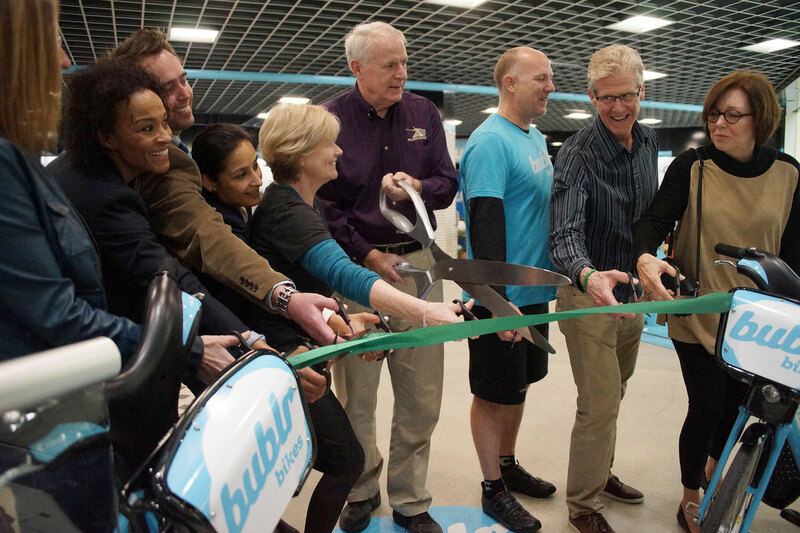 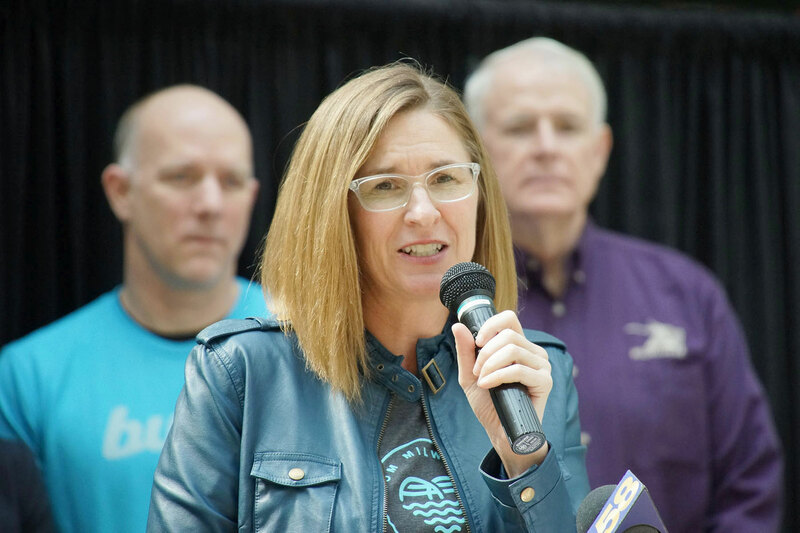 The Bublr Bikes system is a public-private partnership between the City of Milwaukee and Bublr Bikes, with additional support from many other public and private partners. 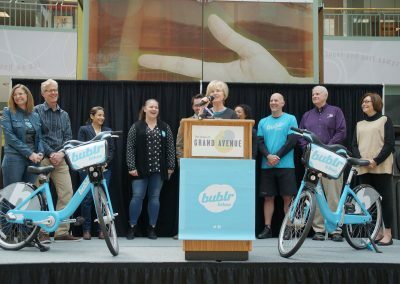 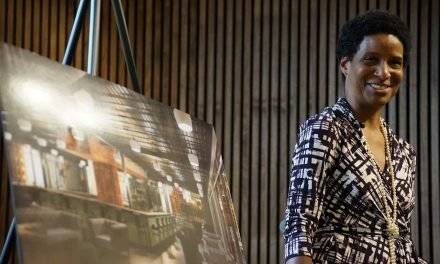 These images are from the ribbon cutting ceremony of the new Bublr headquarters, the latest visible effort of revitalization for the area and an important component in the city’s mass transit network. 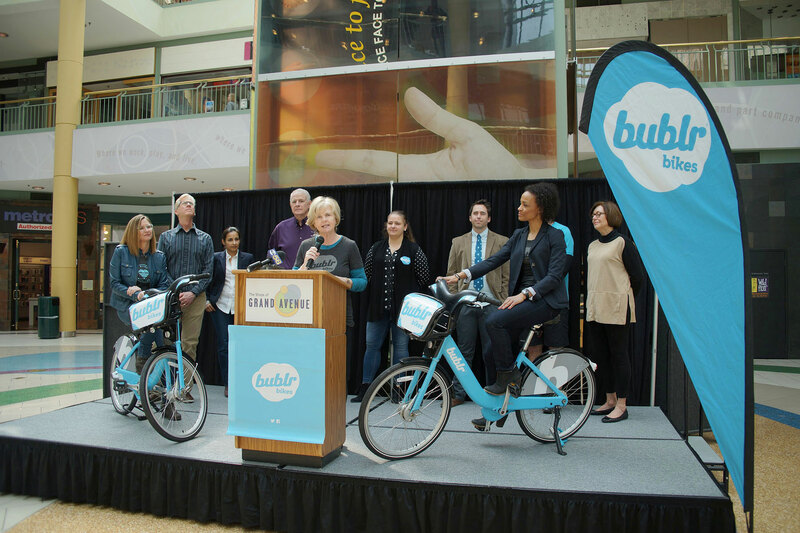 Bublr officials also said they have begun offering a new pay-as-you-go pass that uses a key fob. 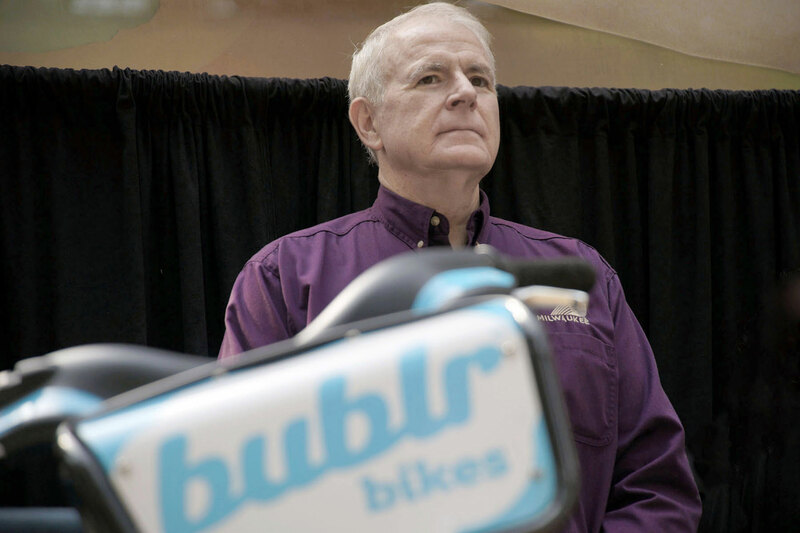 With this alternative, riders get the convenience of a Bublr pass key fob but only pay when they check out a Bublr Bike. Pay-as-you-go users join for a one-time $2 cost and receive a Bublr Pass key fob in the mail. 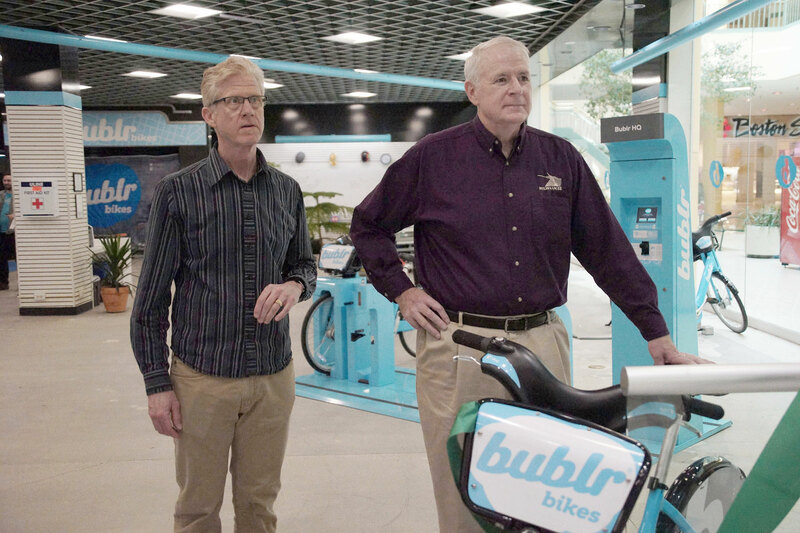 They can swipe the Bublr Pass to check out any Bublr Bike for only $2 per half hour, which is cheaper than the $3 per half hour users pay at stations with credit cards for single rides. Pay-as-you-go pass rides are billed monthly to user credits cards. 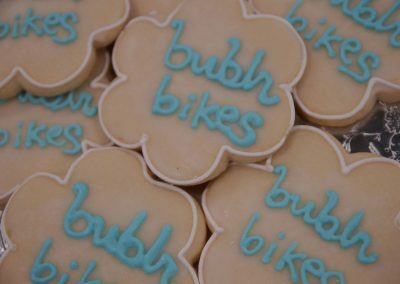 Details at www.bublrbikes.com/go. 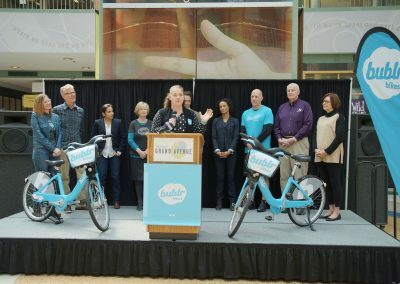 In addition to the new pay-as-you go pass and single rides, Bublr users can buy $15 monthly passes for unlimited 60-minute rides. 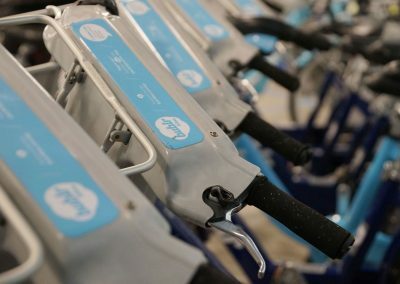 Annual passes are also available. 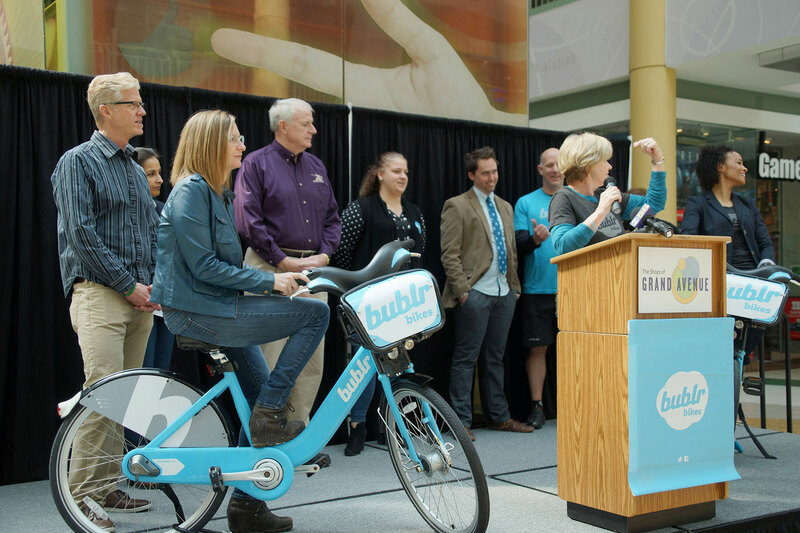 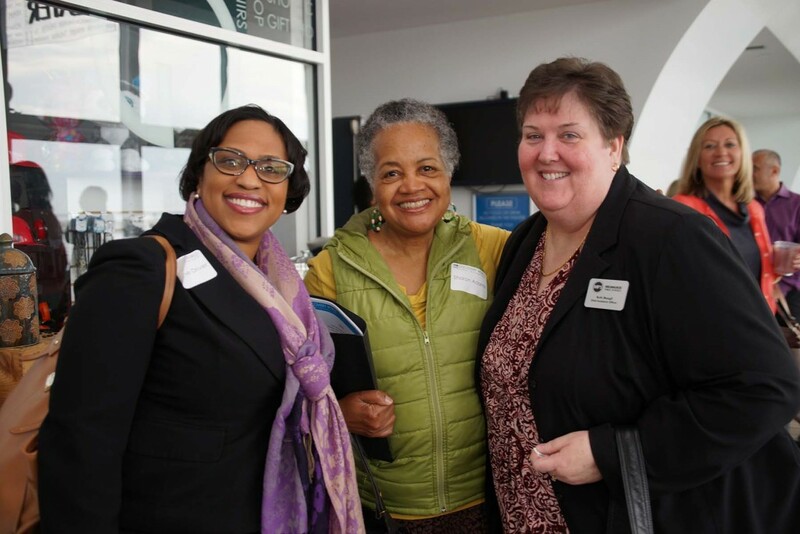 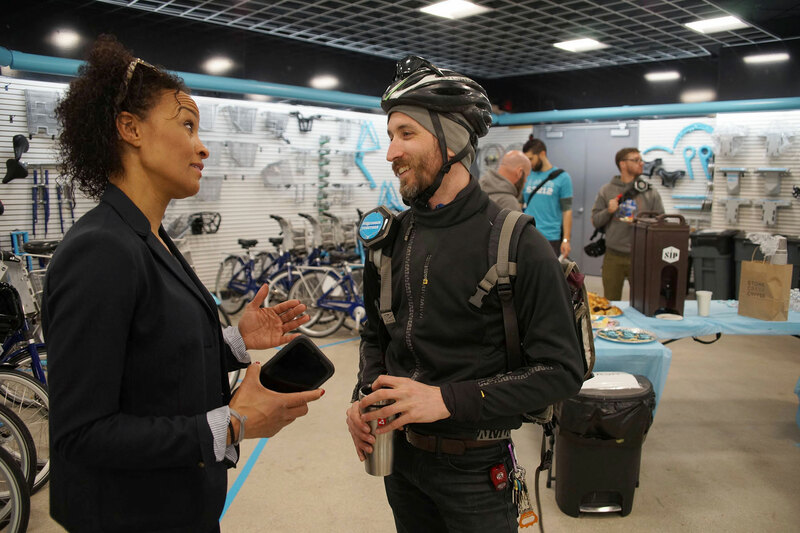 Bublr provides discounted and subsidized passes to a variety of corporate partners, students and City of Milwaukee Housing Authority residents. 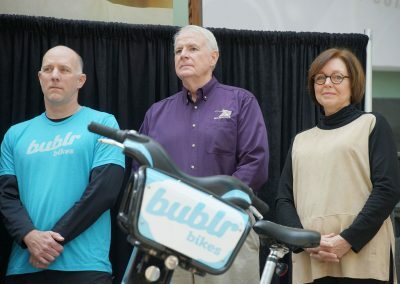 Bikes can be returned to any station.